Topocad is a CAD system made for surveying, designing and mapping. Topocad is close to GIS but also BIM, it contains a lot of computing functions for Geodesy and supports designing. Communication is made with field instruments as well as other design systems, GIS systems or databases. Topocad is a stand-alone package with no other CAD engine and Topocad has a lot of connections both to GIS but also full support of solids and BIM. 1994 was the year when the development of Topocad started, however, it is a well proven system that has been developed over many years. Adtollo offers now 64 and 32 bit systems with all the capacity available. 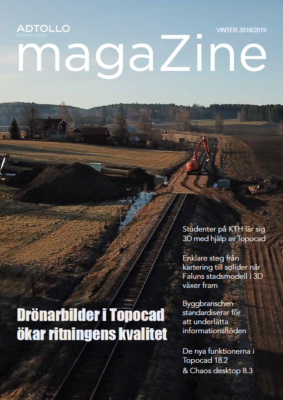 Topocad development takes place in Sweden by Adtollo software specialists. Topocad consists of a large number of modules which are fully integrated and made for mapping, surveying and designing. The system also consists of a number of commands which are specially designed to handle data. Want to learn more about Topocad and CAD (Computer Aided Design)?